Hedge funds were up 8.25% for the year – almost 79% of fund managers are in positive territory for the year while another 19% have outperformed the MSCI ACWI Local Index which was up 17.55% in 2017. Back in 2016, only 58% of the managers were in the green though 25% of managers had outperformed the MSCI ACWI Local Index. Asset base for the industry grew by US$219.0 billion in 2017 – the highest growth in AUM since 2014 with US$113.5 billion of the gain in assets attributed to investor inflows and US$105.5 billion attributed to performance-based gains. This compares with an AUM decline of US$20.1 billion in 2016 where investor redemptions stood at US$55.1 billion while performance -based gains came in at US$35.1 billion. Fund closures outpaced launches for the second consecutive year with 555 funds shutting down in 2017 compared to 489 new launches. In 2016, 769 funds liquidated while 700 launches were recorded. AUM for long/short equities hedge fund managers grew by US$93.0 billion for the year on the back of strong performance-based gains. Long/short equities hedge fund managers were up 12.39% for the year – the best performing strategy in 2017 with equity-long bias funds up 16.85%. The Eurekahedge Crypto-Currency Hedge Fund Index remained unstoppable with 1167.26% gain as of 2017 year-to-date, propelled by Bitcoin's soaring price. Billion dollar hedge funds recorded strong investor interest as of 2017, with net inflows totalling US$64.1 billion while the sub-billion dollar club has accounted for US$49.4 billion in inflows as investor appetite for hedge funds continues to improve. AUM for the North American hedge fund industry reached a record high of US$1.63 trillion. Investor subscriptions for 2017 year-to-date stood at US$66.8 billion, with US$67.3 billion of performance-based gains recorded over the same period of time. The average performance fees charged by hedge funds that launched in 2017 stands at 17.11%, up from 2016's 16.52% figure and is the highest since 2011. On the other hand, average management fees has declined to 1.26% this year from 1.41% in 2016. Asian managers saw asset growth of US$25.4 billion for annual year 2017, with total net inflows of US$9.4 billion recorded, while performance-based gains stood at US$16.0 billion. 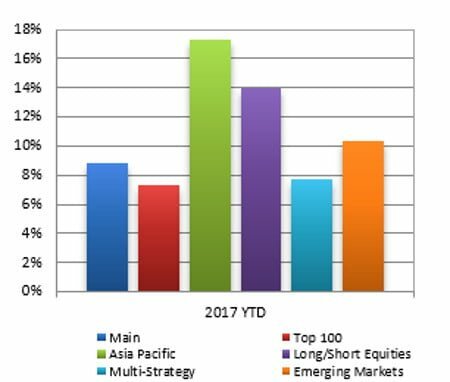 The Asian hedge fund industry oversees 8% of total global assets, or US$195.1 billion in AUM as of 2017. Asia ex-Japan managers were up 20.87% in 2017, with underlying Greater China and Indian managers up 28.83% and 31.35% respectively. Japan focused funds were up 12.54% over the same period. Among regional mandates, Japan mandated hedge funds topped the table for the month, gaining 1.58%, followed by Asia ex-Japan and European mandated hedge funds with gains of 0.93% and 0.74% respectively. Emerging markets hedge funds were also up 0.24% this month. On the other hand, Latin American mandated hedge funds posted the steepest decline, down 0.74% followed by their North American counterparts with losses of 0.27%. On a year to-date basis, hedge funds are up 3.28% while underlying markets gained 7.45%. Asia ex-Japan hedge fund managers led the table up 7.91% followed by their emerging markets and Latin American counterparts with gains of 7.06% and 6.39%. The asset weighted Mizuho-Eurekahedge Index was up 0.87% in December. It should also be noted that the Mizuho-Eurekahedge Index is US dollar denominated, and during months of strong US dollar gains, the index results include the currency conversion loss for funds that are denominated in other currencies. The US Dollar Index declined 0.96% in December. Performance was positive across the board among the suite of Mizuho-Eurekahedge Indices with the Mizuho-Eurekahedge Asia Pacific Index posting the best gains, up 1.67% during December. This is followed by the Mizuho-Eurekahedge Emerging Markets Index and the Mizuho-Eurekahedge Top 100 Index whichposted gains of 1.51% and 1.03% respectively. The Mizuho-Eurekahedge Multi-Strategy Index was also up, gaining 0.74% followed by the Mizuho-Eurekahedge Long/Short Equities Index which grew 0.72% over the same period. 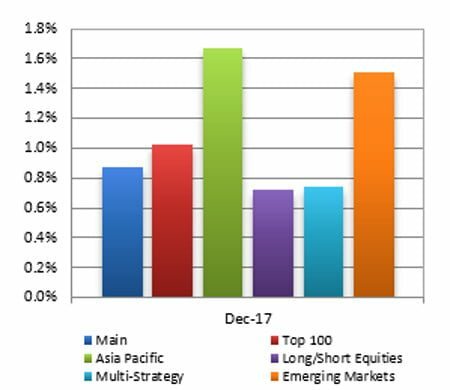 On a year-to-date basis, the Mizuho-Eurekahedge Asia Pacific Index maintained the lead, gaining 17.36% followed by the Mizuho-Eurekahedge Long/Short Equities Index which was up 13.96%. The Mizuho-Eurekahedge Emerging Markets Index returned 10.40% followed by the Mizuho-Eurekahedge Multi-Strategy Index and the Mizuho-Eurekahedge Top 100 Index which was up 7.75% and 7.30% respectively over the year. The CBOE Eurekahedge Volatility Indexes comprise four equally-weighted volatility indices â€“ long volatility, short volatility, relative value and tail risk. The CBOE Eurekahedge Long Volatility Index is designed to track the performance of underlying hedge fund managers who take a net long view on implied volatility with a goal of positive absolute return. 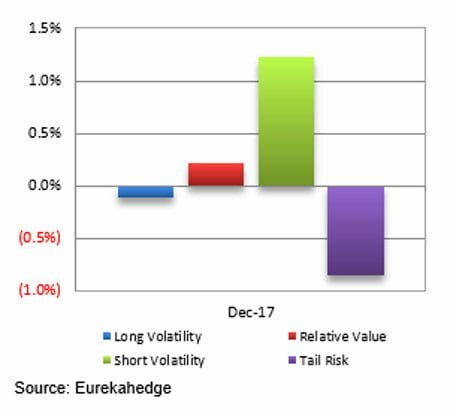 In contrast, the CBOE Eurekahedge Short Volatility Index tracks the performance of underlying hedge fund managers who take a net short view on implied volatility with a goal of positive absolute return. This strategy often involves the selling of options to take advantage of the discrepancies in current implied volatility versus expectations of subsequent implied or realised volatility. The CBOE Eurekahedge Relative Value Volatility Index on the other hand measures the performance of underlying hedge fund managers that trade relative value or opportunistic volatility strategies. Managers utilising this strategy can pursue long, short or neutral views on volatility with a goal of positive absolute return. Meanwhile, the CBOE Eurekahedge Tail Risk Index tracks the performance of underlying hedge fund managers that specifically seek to achieve capital appreciation during periods of extreme market stress. With overall market volatility subsiding as evidenced by the CBOE VIX slipping down 2.30% by end December, short-volatility hedge fund strategies pocketed strong gains in December, with the CBOE Eurekahedge Short Volatility Index topping the tables with 1.23% gains during the month, followed by the CBOE Eurekahedge Relative Value Volatility Index with gains of 0.22%. The CBOE Eurekahedge Tail Risk Volatility Index declined 0.84% while the CBOE Eurekahedge Long Volatility Index also posted losses, down 0.11%. On a year-to-date basis, the CBOE Eurekahedge Short Volatility Index was up 9.20% followed by the CBOE Eurekahedge Relative Value Index which grew 3.36%. 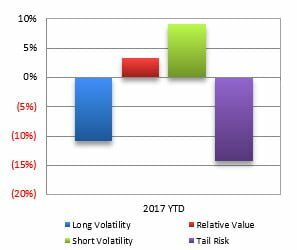 The CBOE Eurekahedge Tail Risk Volatility Index lost 14.27% on a year-to-date basis while the CBOE Eurekahedge Long Volatility Index posted year-to-date losses of 10.92%. Launched in 2001, Eurekahedge has a proven track record spanning over 16 years as the worldâ€™s largest independent data provider and alternative research firm specialising in global hedge fund databases and research. Headquartered in Singapore with offices in New York and Philippines, the global expertise of our research team constantly adapts to industry changes and needs, allowing Eurekahedge to develop and offer a wide array of products and services coveted by institutional investors, family offices, accredited investors, qualified purchasers, financial institutions and media sources. In addition to market-leading hedge fund databases, Eurekahedgeâ€™s other business functions include hedge fund research publications, due diligence services, investor services, analytical platforms and risk management tools.